Cell toxicity, or cytotoxicity, is defined as the ability of certain substances or mediator cells to destroy living cells. Exposure of cells to a cytotoxic compound is ultimately lethal and induces either necrosis, during which the cells lose membrane integrity and die rapidly, or apoptosis (programmed cell death). Cell death, in terms of cell viability, is thus a common end point in toxicological studies. However, cells usually undergo morphological changes before the actual cell death occurs. Healthy cells are often irregular and rather thin, dying cells are small, less irregular and thick, while dead cells are round and thin. Analyzing these features thus enables detailed understanding of the cell death process, both for individual cells and cell populations. DU-145 prostate cancer cell undergoing apoptosis. The graph illustrates how morphological changes, in this case in cell volume and thickness, precede the actual cell death. Cell death is a process that rarely occurs as an instant event. HoloMonitor® time-lapse cytometer can be used to study and analyze dying cells over time by non-invasive monitoring of changes in a long row of cell morphology parameters. The analysis includes data for both individual cells and entire populations at the same time. Detects early signs of drug responses even before the actual cell death occurs. Images can be recorded with high temporal resolution (maximum image rate: 1 image/s), ensuring that important cellular events are not overlooked. Quantitative and kinetic assessments of morphological parameters, including cell volume, area, thickness and irregularity and many more. When preferred, further analyses can be undertaken for example to assess cell growth inhibition or to detect influences on the cell cycle. The graph is an example showing how morphological parameters can differentiate between untreated cells and cells treated with an cytotoxic substance. In this case cell thickness is plotted vs irregularity. 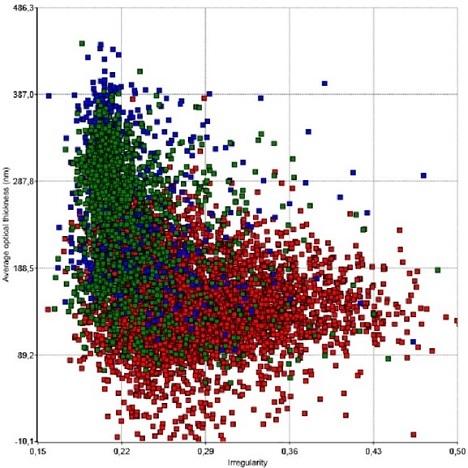 Green dots represent untreated, and blue and red represent etoposide-treated L929 cells.